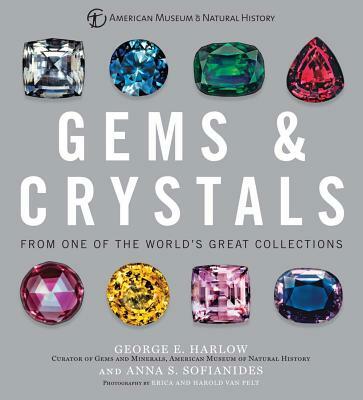 George E. Harlow, PhD, Chairman of the Department of Mineral Sciences at the American Museum of Natural History, is an eminent mineralogist and crystallographer. While interested in a broad range of geologic topics, he specializes in the study of rock-forming minerals, and has recently carried out research on the jadeite variety of jade, examining the source in Guatemala and the provenance of jade for New World jade artifacts. Anna S. Sofianides has a master's degree in geochemistry and geology and is an alumna of the Gemological Institute of America. Now retired, she worked for 23 years in the Department of Mineral Sciences at the American Museum of Natural History. A tireless researcher, Ms. Sofianides has been collecting data on gemstones and the Museum's collection since 1974. Harold and Erica Van Pelt are recognized among the top photographers of gems and gemstones in the world. Their work has appeared in Lapidary Journal, Gems and Gemology, Rock and Gem, and Mineralogical Record. The American Museum of Natural History is one of the world's preeminent scientific, educational, and cultural institutions. Since its founding in 1869, the Museum has pursued its mission--to discover, interpret, and share information about human cultures, the natural world, and the universe--through a broad program of scientific research, education, and exhibition. Each year, approximately five million visitors experience the Museum's 45 permanent exhibition galleries, which include some of the world's greatest dioramas, fossil halls, the Theodore Roosevelt Memorial Hall, and the Rose Center for Earth and Space, home of the Hayden Planetarium. The Museum's collections, only a tiny fraction of which are on view, surpass 33 million specimens and artifacts. They are an invaluable resource for the Museum's 200 scientists, for graduate students in its Richard Gilder Graduate School--the Western Hemisphere's only museum-based PhD-granting program--and for researchers around the world.